Bad Faithed has recently come into being. It’s a movement, a focus, and a forum. It is born out of indignation at the betrayal of trust that can happen within Faith organisations – and the conviction that such betrayals should be brought to light and stopped. Until now, there has never been one place where public and private individuals could work together for change and restoration. Now there is Bad Faithed. 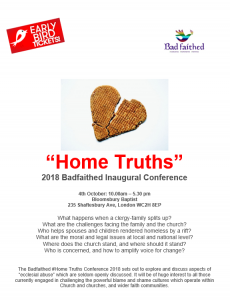 And our first event #Hometruths, is on October 4th 2018 in London. Please drop across to our events page to find out more and be part of this breakthrough open conference. Badfaithed is a movement for the restoration of faith in religious institutions through transformed organisational practice addressing betrayal of trust and poor performance in whatever form it has taken. The public has become painfully aware through reports in the press and from government sponsored independent commissions of a wide range of serious under performance and betrayal of trust, unjust treatment of employees and those holding office, inequality between the sexes, sexual harassment, racial discrimination, child abuse and a culture of cover-up and collusion. Badfaithed is committed to shining a light on these areas of poor behaviour which are frequently not the fault of a few ‘bad apples’, but rather systemic issues which require sustained and evidence-based change. The charity will seek through symposia, training and research to build the capacity of faith-based communities to operate with greater transparency, accountability and fairness across the areas of specific concern. These areas will be highlighted by the Board of Trustees in consultation with an Advisory Panel built from sociologists, psychologists, lawyers, theologians, and members of the faith communities. Over the next year Badfaithed will focus on a range of issues pertaining to ministerial households, by raising awareness, sharing good practice and seeking to bring about transformation within religious institutions. Owing to the recently revealed scandals of child abuse and forced adoption we are all painfully aware of how badly wrong Faith organisations can go; both in terms of the evil itself, and of the collusion and cover-up which can so often follow it. And yet there is other serious damage being done, quietly and behind closed doors, which must also give us pause for thought. Dig a little, and you find examples of sexual harassment, employment abuses, racial and sexual discrimination. Because Faith organisations are, generally, held in high regard – and their personnel placed in positions of great trust – that wrongs can be left unscrutinised. And yet it is that very trust which should make them more – not less – accountable. We are a charity which needs you very much. We need your experience, experiences and evidence. We have a need both for members of the public and for Faith professionals. We need your involvement, input, advice, research, energy; support of any and every kind. We intend to make Faith organisations safer places.